One of the things that ticked me off this week was the induction of ABBA into the Rock N’ Roll Hall of Fame. I wouldn’t have minded Genesis – there’s something about Phil Collins’ old band playing in the eight-track cassette players of old Isuzu Gemini taxis that is OK by me – but the induction of ABBA left me seething. Don’t get me wrong: ABBA deserves a recognized place in music for all they have achieved, but as a fan of rock n’ roll, I have problems with ABBA sharing the same place as people who have invented, shaped, and influenced the music that not only reverberates through my ears, but flows through my veins. I do not hold the monopoly of knowledge of what rock n’ roll is, but ABBA is not the first thing that comes to mind. All this wannabe roadie-slash-heavy metal fanboy rage brings to mind the spirit of a Hall of Fame: that even in the Valhalla of a chosen endeavor or art, one cannot escape politics. Remember when Carlo J. Caparas got proclaimed as a National Artist? All the rage and anger of artists and their supporters did nothing to invalidate the honor (wrongly) conferred to Caparas. If anything, the people who enter a Hall of Fame of any sort are not judged by the merit of their body of work, or if they fit the purposes of the Hall. There are people who decide: unfortunately, it is not us who do so. At the end of it all, the decision lies in those who – by thought or by consequence or by virtue of hierarchy – decides who stays and who goes. Surely, an avid music listener – or a bigger fan of rock n’ roll – would have a longer list of people and acts who “deserve to go to the Hall of Fame more than ABBA ever would.” Yet like many things, the vox populi vox rock n’ roll plays second lead guitar to the will of those who control things. 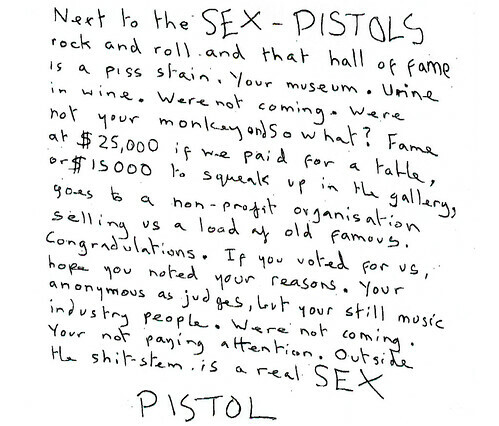 True: while an award should never dictate taste, and while an award should never be the prime motivation of artistry – in this case rock n’ roll – I guess that award-giving bodies should still give due recognition to why such a place of privilege exists. It’s not for the whims of the few who say who gets in and who gets sent out, but for those who truly listen and believe. Sometimes, the preferences of the few reign and lord over the choices of the many. How relevant, so to speak. In places where one makes it in, too many of the rest get left out.